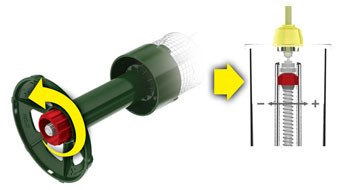 This Squirrel Buster Peanuts Plus bird feeder design is made with Squirrels Buster technology, it is an innovative product that offer an effective way of deterring squirrels. It is made with a 3/4 quartz capacity that can hold shelled peanuts or wild bird food nuggets. This woodpecker / squirrel-proof feeder will attract a large variety of backyard birds like Downy Woodpecker, Red Breasted Nuthatch, White Breasted Nuthatch, Blue Jay, Red Bellied Woodpecker, Tufted Titmouse, Chickadee, and Hairy Woodpecker. The metal mesh makes it suitable for clinging birds. This Squirrel Buster Peanut Plus Wild Bird Feeder is equipped with a squirrel- proof mechanism. When the squirrel jumps on the feeder metal mesh, its weight closes the shroud down automatically. This closes access to the food, and effectively stops the stealing. This will also stop larger birds that are big enough to activate the mechanism. No animal will be harmed this way. The design is made to control how much weight will the mesh support, allowing the smaller birds to feed, any additional weight will activate the mechanism and the door will close. This spring design is calibrated at 2.5 ounces (70g). If the weight reaches 5.3 ounces (150g) it will close to the maximum. This way it shuts smaller Red squirrels, and biger Gray Squirrels. As this bird feeder comes with a weight adjustment mechanism, you can try to adjust it to suit your needs and to shut out larger birds. You will have to experiment with this to block the larger birds, there is a manual provided in the box. 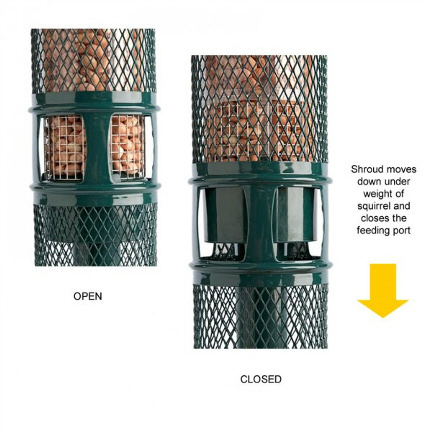 Very small number of users have reported that the closing mechanism stays half shut after large birds visit the feeder, to fix this try to adjust the level of sensitivity so that it comes back. It is recommended to use it at factory settings before you make some additional adjustment. This design controls how much weight can be allowed on the mesh shroud before the mechanism closes. If additional weight than the one you setup your self is put on the feeder it closes down. The bird feeder comes at the factory settings to hold 2.5 oz. / 70g. It will close fully at 5.3 oz. / 150 g. I advise to try use it at the factory settings and then see if it works as designed, if not do adjustment as pleased. There is a red dial that is located at the bottom of the bird feeder, when you locate it turn it counter clockwise, when you do this it will lower the required weight of the closing mechanism. When you turn it the nut inside in red color will move up and this reduces tension on the spring and adjusts the settings. To increase the setting for the weight required you must rotate the red dial in the clockwise direction. When you do this watch the red nut, it must move down from the current setting, and will increase the tension on the spring. The bird feeder is equipped with a ventilation system to prevent moisture and mold. 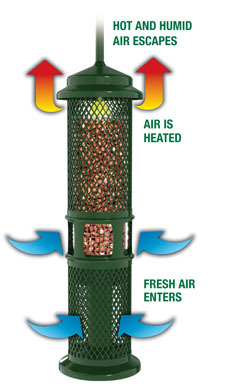 This feeder has a good ventilation system that is design to keep the seed dry and the birds safe. Mold and bacteria is dangerous to the birds, and check the feeder often for this. Check the feeder once a week to prevent this. No ventilations system is %100 perfect, so check the bird feeder for mold. You can do this easy when you refill. This system will save you seed and keep the birds safe. What birds will fly to this Clinging & Woodpecker peanut bird feeder? 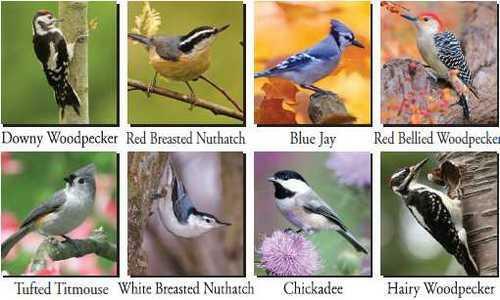 If you install Brome Squirrel Buster Peanut Plus Wild Bird Feeder feeder, the variety of birds that will come to feed are: titmice, jays, chickadees, woodpeckers and nuthatches. Most of the birds that will come to this bird feeder are clinging birds, the birds that need perches are not going to be attracted to this feeder, but you will still get a lot of different birds visiting. It is best to place more than one type of bird feeder to attract more variety of birds. Sparrows and starlings will come and try to take peanuts from the feeder, sparrows are small birds and cannot be deterred by the closing mechanism, so you just have to put up with them if they visit. Starlings are larger birds and you can try to adjust the closing mechanism to prevent them, I recommend you experiment with this till you find the right settings. The larger birds will maybe spill some seed when they cling on it, but in my opinion as long as the bird cannot get the seed with a beak it is going to give up at some point. You can get large quantities of peanuts in your local store or online, check peanuts here. This birds will eat suet and seed along with peanuts, these food is high in protein and fat, this gives the birds valuable nutrition and supplement to their diet. So as you see this type of food is very high nutritional value for birds, specially in winter and spring. You can offer them in shells or just the heart of the peanut, store it in a cool and dry place to preserve it. You can offer peanut nuggets that you can buy at your local store or online at amazon. This nuggets are good wild bird supplement, and produce a high energy to keep the birds going at winter times and in spring. It is packed with lots of nutrition that birds need when raising young, and will come gladly to eat them. Most of these nuggets are made of rendered beef suet , peanuts, corn, and raisin nuggets, the mix provides a rich nutrition food for wild birds. Can I use this bird feeder for sunflower seed or other seed? This feeder type is design for peanuts shells or peanuts heart, the birds come and cling on the side of the feeder and peck at the peanuts or nuggets and brake off small chunks. If the sunflower seed is used birds will have a hard time extracting it from the wire grid. The small song birds will have trouble feeding from this type of feeder as they don’t have pointed beaks. Every bird feeder works best for the design that it is made for, this one is used best for woodpeckers and other clinging birds. Also the birds that eat other seed type like to perch, and this feeder comes with a clinging design. To refill the feeder you have to take it down, place it on the table, then unscrew and remove the top portion to get to the peanut reservoir, refill it with new stock and assemble it back together. To refill this bird feeder you have to take it down from the place it is hanging. This feeder is not the largest capacity bird feeder on the market, so you will have to refill it more often then others, maybe every other day or so. That can be a little of a down side for some birds lovers. 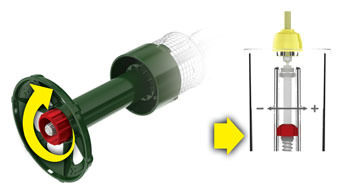 This bird feeder is easy to hang with a extension hook. Place it next to a tree or on the side of the house, from where you can watch the birds feeding. Make sure the squirrel must place all of its weight on the feeder if it jumps on it to activate the closing mechanism. To do this place it away from the ground. If you have bear and raccoon problem, it is best to take the feeder down at night, as these animals like to come when you sleep and can damage the feeder. Raccoons are nocturnal animals and this is the time when they look for food. 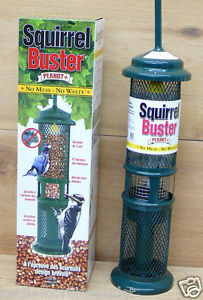 The Squirrel Buster Peanut Plus Wild Bird Feeder dismantles for convenient filling, and cleans easily. Wash the wire shroud and feeder tube by hand; the feeder tube can also be cleaned on the top rack of a dishwasher. It is rust proof and can be exposed to harsh weather like rain and snow. It will last for years. The brome feeders have reputation of good quality design, and I have come to the same conclusion over time. Most of the buyers do confirm this, and are pleased with the function of the feeder. This bird feeder is maybe a little less capacity then other brome feeders, but gives the same squirrel proof design, and will last for years. This bird feeder comes with a 2 year warranty as other brome feeders, this looks to be the standard with all brome bird feeders and is good news. Check Squirrel Buster Peanut Plus Wild Bird Feeder here.